We Manufacture And Export Sheet Feed Paper Bag Making Machine For Shopping Bag, Sheet Feed Paper Bag Machine For Luxury Bag, Roll Feed Paper Bag Machine For Food Bag , Roll Feed Paper Bag Machine Shopping Bag, And Roll Feed V Sharp Paper Bag Making Machine For Bread Bag, Roll Feed Paper Bag Machine For Chicken Bag, ETC. Our Paper Bag Making Machine Include Roll Fed Paper Bag Making Machine, Roller Fed Fully Automatic Paper Bag Making Machine With Round Rope Handle Loop, Fully Automatic Roll Fed Paper Bag Machine With Flat Handle Loop Machine, Sheet Fed Paper Bag Making Machine, Fully Automatic Sheet Fed Paper Bag Making Machine With Round Rope Handle Loop Machine, And So On. This Is A High Quality And Precise Roll Feed Paper Bag Making Machine. Our Customers Using This Paper Bag Making Machine To Produce Grocery Bag, Food Bag, Bread Bag, Shopping Bag Etc. This Paper Bag Making Machine CPU From Germany ,Touch Screen From Germany, Servo Motor From Germany .Servo Driver From Germany. Main Motor From Germany Siemens. Main Inverter From Switzerland Abb. Photo Sensor From Germany. Low Voltage Appliance From France Schneider .Photo Electric Sensor From Japan. Reducer From Germany. EPC Control From Italy. Driving Bearing From Germany. Even The Paper Bag Making Machine Ink From USA. The Strong Quality Parts + Perfect Machine Structure Make The Machine Working In High Speed And Stable. 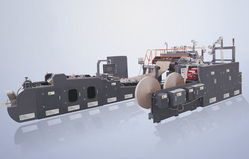 This Is Sheet Feed Shopping Paper Bag Machine. People Using Paper Bag Machine To Do The Shopping Bag, Luxury Bag, Coffee Bag, Powder Bag, Etc. Our Paper Bag Machine Adopt Mechanical, Electricity, Light, Gas Integration Technology, Combine A Number Of Its Proprietary Technology, Use The Creased Sheet Paper As Raw Material, Can One Time Finish: Paper Feeding, Positioning, Top Folding, Tube Forming, Gusset Forming, Bottom Opening, Bottom Cardboard Inserting And Bottom Gluing Automatic, Then Compaction Output. Our Paper Bag Machine Main Part: Bearing From Japan NSK, Vacuum Pump From Japan, Belt From Germany, Switch And Connector From France, POM Gear From Japan, Main Motor From Switzerland, PLC From Japan, Touch Screen From Taiwan China The Paper Bag Machine Material : Brown Paper, Copperplate Paper, White Paper Board, Laminated Paper ,Etc. 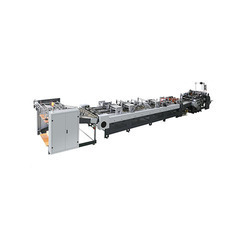 This is fully automatic roll fed paper bag making machine, This paper bag making machine can do square bottom paper bag, square bottom paper bag with round rope handle loop. The machine can do different size paper bags. Our Automatic Paper Bag Making Machine Can Produce The Square Bottom Paper Bag. 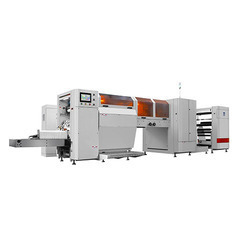 It Has Many Advantages Such As High Productive Efficiency ,High Speed, And Wide-Range Adjustment. Automatic Errors Correct System ,Automatic Raw Material Feeding, And Tension Control, All These Operational Procedures Are Controlled By The Automatic Paper Bag Making Computer. This Is Ideal Automatic Paper Bag Making Machine For Producing Various Kinds Of Paper Bags Such As Food Paper Bag, Bread Bag, Cosmetics Handle Paper Bags, Etc. 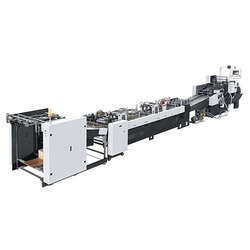 This is sheet fed paper bag machine can do the paper bag with handle loop in fully automatic.The machine is using sheet paper as material to do the shopping bags. 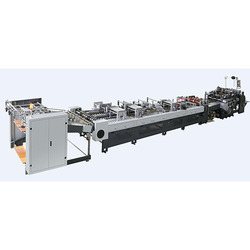 It is high-quality paper bag making the machine, and operating is controlled computer system. One Line. The Paper Bag Making Machine CPU From Germany. The Paper Bag Making Machine Working In High Speed And Stable. This Paper Shopping Bag Making Machine Is Your First Choice To Do The High-Grade Luxury Bag, Shopping Bag, Handle Bag, Brown Paper Bag, White Paper Board Bag, Copperplate Paper Bag, Grey Paper Board Bag, Luxury Laminated Bag, ETC. The Paper Shopping Bag Making Machine Main Part: Vacuum Pump From Japan, Switch And Connector From France, Belt From Germany, Bearing From Japan NSKPOM Gear From Japan, Main Motor From Switzerland, PLC From Japan, Touch Screen From Taiwan China. 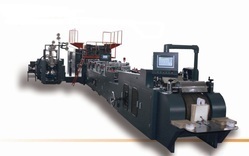 Working Procedure Of The Paper Shopping Bag Machine: Paper Feeding—Automatic Die Cut—Gluing—Tube Forming—Tube-Bottom Folding—Bottom Gluing—Bag Output. This Automatic Paper Bag Making Machine Is The Ideal Equipment Which Is Using Flat Papers As Raw Materials To Make Into Paper Bags In Square Bottoms. 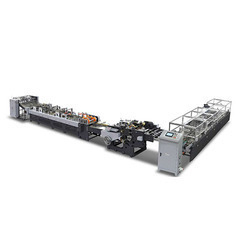 Its Technique Process Is :The Flat Papers After Printing Are Delivered To The Driving Parts For Positioning Through Automatic Paper Feeder And Press Line With Rolling Press Device And Then Make One-Side Glue, Folding And Positioning And Sticking And Conveying Device Will Convey Them Into The Bottom Position And Conduct Press Horizontal Line, Open Bottom, Make Glue And Press Together And Finally Output Finished Bag Products. 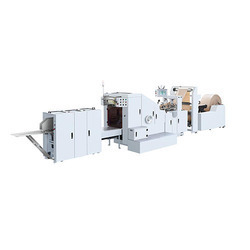 This Is Fully Automatic Sheet-Feeding Paper Carry Bag Making Machine Which Is Suitable For Producing Paper Carry Bag, Paper Shopping Bag, Luxury Bag, ETC. 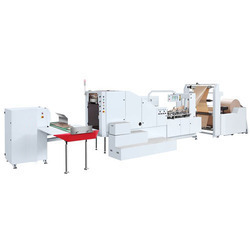 The Paper Carry Bag Making Machine With Equipped With PLC Programmable Control, Frequency Control Technology To Realize The Integral Multi-Dimensional Control, More Centralized Control And Single Point Remote Control Operating.